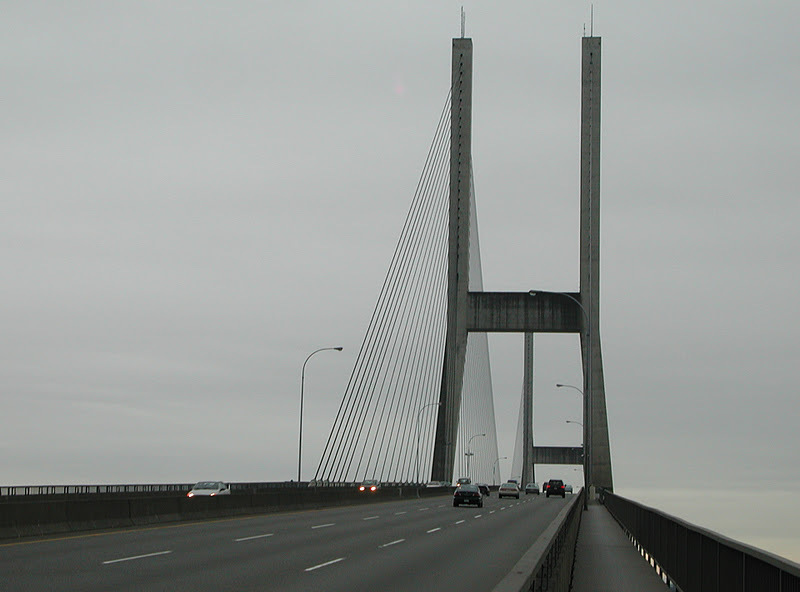 The Alex Fraser Bridge has a composite superstructure made up of a reinforced concrete deck securely attached to longitudinal girders that act together in bending. This was the first use of a composite superstructure for a cable-stayed bridge and it was how such a long span (at that time) was achieved. Soon, much longer spans were achieved using composite and steel superstructures. The cables are in a semi-fan arrangement with the longest cables attached to the top of the tower legs and the shortest cables at the cross-support on the tower legs. It looks like the superstructure is suspended above the bottom crossbeam of the towers. This would be helpful during an earthquake since the towers could move out-of-phase (longitudinally) with the superstructure. However, the superstructure looks like it is up against the legs of the towers, which means they will move together transversely (putting a lot more load on the towers). The bridge owner is the British Columbia Ministry of Transportation. The designers were CBA-Buckland & Taylor Ltd. who also provided support during construction. The main contractor was Paschen Pike with Canron in charge of steel construction and PCL handling cable installation (the cables were provided by Bridon International). Construction took 27 months (from 1983 to 1986) and set the record for the lowest cost per square foot of a cable-stayed structure (at that time). The bridge has a width of 32 m (105 ft) and carries six traffic lanes as well as pedestrians and cyclists. The bridge has a total length of 2602 m (8540 ft) and carries Highway 91 over the Fraser River from Annacis Island south into the North Delta Region. Vancouver's Bridges: Alex Fraser Bridge (2) by Mark Yashinsky is licensed under a Creative Commons Attribution-NonCommercial-ShareAlike 3.0 United States License.